However, when he heard me scream the other night, he came charging out of the house barefoot. Not the best choice given what was wrong, writes Suzanne Shubart. Our puppy had bailed up a metre-long snake. Phil insisted it was a red-bellied black snake, but when I later presented him with a photo line-up, he pointed confidently to an eastern brown snake and announced, “That’s the one!” Anyway, it doesn’t really matter which species because in Australia nearly all snakes are venomous (some more so than others). The sight of our Labrador Lila in a stand-off with a potentially lethal creature had taken my screams to a new pitch. Blood curdling they reverberated throughout the valley prompting neighbours to come running from all directions. One brave woman wielding a large stick. No one knew what to expect. Lila, on the other hand, appeared to be deaf. Mesmerised by the snake. With only a few inches between them. Every time I tried to grab her collar, the snake would rear up and strike out. We’d both recoil, but then Lila would go back for more before I could stop her. My screams had words attached, but it was hard to tell. When Phil arrived on the scene, he shouted, “Get her some food!” hoping to break the spell by offering Lila what Labradors' live for. I found myself shrieking, “Lila, would you like some dinner?! ?” Perhaps the question was indecipherable because it clearly had no impact. That’s when Phil somehow managed to get hold of Lila without being bitten himself. But we still didn’t know whether or not the snake’s fangs had contacted Lila because puncture marks are virtually invisible under a dog’s fur. We wasted no time getting her to the nearest veterinary hospital. While travelling there, she showed no signs of distress. No vomiting. No salivating (no more than usual). No trembling. And her pupils were not dilated. She seemed fine, but the vet did appropriate blood tests to make sure. Apparently, Lila had not been bitten. 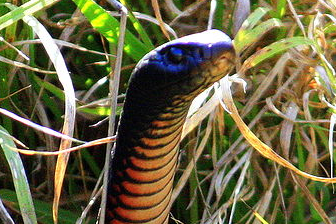 Or perhaps had received only a “dry bite” (snakes sometimes reserve their venom for prey rather than waste it on predators). At any rate, she took the whole episode in stride and enjoyed swapping notes with other patients in the vet’s waiting room.